KingArthur.org.uk | Contest #2: Merlin’s Shadow! CONTEST #2 IS OPEN UNTIL JULY 25th! Hello from Robert Treskillard, the author of MERLIN’S SHADOW, book 2 of The Merlin Spiral. Welcome to the contest for book #2! There are some awesome prizes below, so make sure you read to the bottom! The one with the most points wins, and those points also count toward THE GRAND PRIZE. But … keep in mind that even though the contest for promoting book #1 is officially over, YOU MAY STILL SUBMIT POINTS in that contest in addition to this one up to the level of 13,600 points, which is the highest level achieved at the end of the contest. This will allow you to earn points toward THE GRAND PRIZE OF YOUR VERY OWN EXCALIBUR! So don’t stop! You can do it! One interesting thing is that I will probably open Contest #3 while Contest #2 is still finishing up. This is my fault for getting the contest going late, but I think it will be exciting to have them both going at the same time for a few weeks. At the end of the video, you need to hold up a copy of Merlin’s Shadow, talk a little bit about it and the contest, and then mention the website of KingArthur.org.uk. If you think up an activity that fits Merlin’s Shadow and want to propose it to Robert for points, contact him here. If he thinks it’s a valid point-getter, he just may open it up to everyone. 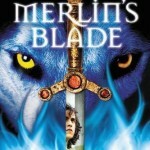 Is there a book trailer for Merlin’s Shadow or do we use the trailer for Merlin’s Blade? It would have been *really* fun to film a separate book trailer for Merlin’s Shadow, but no, you’ll have to use the one for Merlin’s Blade.